This play, written by Oscar Wilde in 1895, is a witty comedy that takes place in England. John Worthing (Jack) is a gentleman who owns a house in the country. He is the guardian of a young girl, Cecily Cardew. Jack likes to spend time in town, so he creates a fake younger brother, Ernest. “Ernest” is constantly getting into trouble, or so Jack tells everyone. He uses this excuse to go into the city, and goes by the name of Ernest Worthing when he is there. Algernon Moncrieff is “Ernest” Worthing’s good friend. He has a young cousin, Gwendolen Fairfax, who Ernest wants to marry. Algernon learns of Jack’s disguise, and goes into the country to visit Cecily. Algernon pretends to be Jack’s younger brother (Ernest), and ends up falling in love with Cecily. Both Gwendolen and Cecily think they are marrying Ernest Worthing, without realizing there is no such person. The play is full of misinterpretations and irony. Witty dialog and amusing, over the top characters make this play an excellent read. 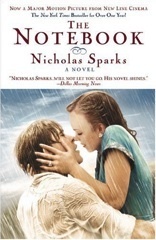 The Notebook takes place in a nursing home. An elderly man is telling a story to an elderly women who had Alzheimer’s. Where he starts off in the story is in a small town called Seabrook, South Carolina. Noah Calhoun had gone to a carnival, which there he met Allie Hamilton.They went out on a date, and since then they were inseparable. But one problem is that Allie comes from a rich family, and is leaving to go to school after the summer. Where Noah comes from an non wealthy family, and works at a lumber mill. One night Noah had taken Allie to an abandoned house, and promised her he would fix the house where they can live together. Allie’s parents are not too impressed with her choice, and forces her not to see him anymore. When Allie moved with her family to go to school, Noah went off to war. Allie had met Lon while he was harmed in battle, and she was his nurse. Later on when Lon’s fractures healed, he asked Allie out on a date. Soon after he asked her to marry her. While this was all happening Noah was rebuilding the house, and got his picture taken for and article in the paper. Allie saw the article, and decided to visit him. Their love grew stronger than ever after spending a few days with each other, just like when they were teenagers. Allie was torn with the decision of choosing her teen love, Noah, or her fiance, Lon. 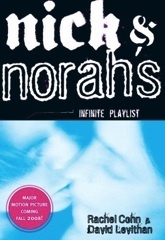 She gave Lon her word to marry him, but her love for Noah is still there after the summer they spent together. Who will it be? Who is the elderly man and women? You have to read to find it out. The WHS Library owns The Notebook. The book That Summer is about a fifteen year-old girl named Haven. He father has an affair with the ” Weather pet” as the family would call her. Which they end up getting married. Seems that almost everyday Haven is complaining about how she is six feet tall and is still growing! She is just so confused where she fit in anywhere. 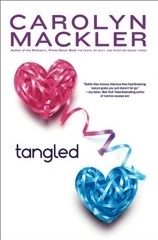 Before her family life fell apart, Haven had a crush on her sister’s boyfriend, Sumner. Now Sumner is back in her life and charming her, not her sister. Soon in her sister is getting married to a man the haven hates. She just keeps wishing everything was back to normal. I would say that this book is teen girls. There are many connections that could be made throughout this story. I really enjoyed it myself. The WHS Library owns That Summer. 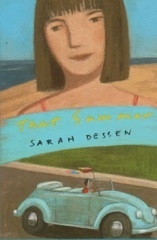 The book Just Listen by Sarah Dessen, was about a teenage girl named Annabel whose life looks perfect. Annabel is a model and she is very popular. Her life is not what it seems. Her older sister Whitney, has anorexia and her whole family starts to fall apart. Her friends stop hanging out with her. During school no one talks to her and she feels out of place, until she meets Owen. Owen helps her get through all the drama in her life and they become very good friends. After they became friends she felt safe telling him about her family problems. 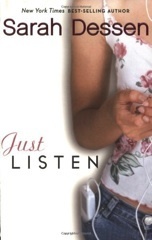 I would recommend this book for a teenage girl. The issues Annabel experiences could make someone experiencing similar issues feel less alone. The WHS Library owns Just Listen. The book Glass is an amazing book. It is one of those books you feel like you can’t put down. The book drags you into the story of Kristina’s life and her drug addictions. You would really enjoy this book if you are into realistic books. The story is about a girl named Kristina who has two different sides. One side of her is Kristina and the other side of her is Bree. Kristina is the good side, the side that wants to be a good mother and wants to make enough money to take care of her son, Hunter. Bree is the bad side, the side that wants to get high all the time to make herself feel better, the side that wants to just hangout with friends and smoke crystal meth no matter how much it costs. She is using the money she would spend on her own son for drugs. That’s how addicted the side of Bree is to drugs. Kristina is having a hard time deciding how she wants to live her life. Her mother had already taken her son Hunter from her because of her drug problems. Her mot!her had even kicked Kristina out of the house. 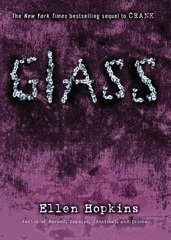 The WHS Library owns Glass and many other books by Ellen Hopkins. The story unfolds when high school sophomore Laurel Sewell wakes up one day to find something resembling wings growing forth from between her shoulder blades. With few friends, she manages to find herself torn between the only two people who know her secret. When a dangerous enemy appears on the scene, perhaps threatening both the safety of Laurel’s family as well as the faerie kingdom itself, both boys do their best to rush to Laurel’s rescue. I liked this book because it was interesting from the beginning to the end. And I can relate to a lot of things Laurel feels in the book. I’d recommend this book to teenage girls because it tells a story about a girl who is a normal teen going to high school. And teenage girls would be able to relate to some things Laurel deals with. 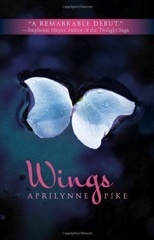 Check out Melanie’s interview with the author of Wings, Aprilynne Pike. 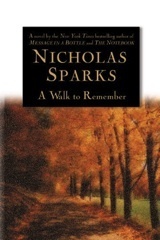 A Walk To Remember was one of best book that I have ever read.Once I started to read it I thought it was nothing like the movie. 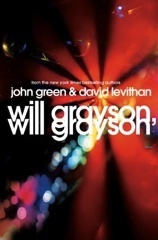 The movie made it look like Landon didn’t want to do anything he did, but in the book he did the things he did because he wanted to get into a good college. I think the book is a lot different from the movie. WHS Library owns this book.